Hannibal is a show that runs on expressionism. The unique nightmarish quality that gives the show its signature beautiful atrocity aesthetic comes from a very simple concept that is rarely seen on television: Everything that happens on screen is a manifestation of a character’s emotions. Thematically, this is extremely tight writing, and makes analysing the show a special pleasure in comparison to other network dramas. From a storytelling standpoint, this means that every symbol has implications on a deep character level. Hannibal’s fuel tank is also filled up with the rich source material of movies and novels dating back to 1981, when the eponymous character first entered the world in chapter one of Thomas Harris’ Red Dragon. Almost every character in the show has her or his origins in an iteration of Red Dragon, Silence of the Lambs, Hannibal, or Hannibal Rising. When it comes to understanding exactly what to expect from Hannibal (especially at this point in the series when everything looks ready to finally see Doctor Lecter put behind bars in the upcoming season two finale), the two most important characters are symbolic representations of who Will Graham and the titular serial killer are not. At least anymore. In the season one episode “Entree” two characters that are essential to the storyline are introduced: the non-canonical Miriam Lass (Anna Chlumsky) and Doctor Abel Gideon (Eddie Izzard). Despite neither of them being in the books, what these two characters represent is a mission statement for the show. They represent everything that Hannibal is based on, and act as vehicles for that material to eventually implode and free the main characters from the imposed expectations of previous narratives. Let me explain: Miriam Lass is Will Graham from the novel Red Dragon (with a little bit of Clarice Starling thrown in for giggles) and Abel Gideon is Hannibal Lecter as portrayed by Anthony Hopkins. Separately, they find themselves trapped in the motions of their source material, each encountering the newer, more real Hannibal Lecter and failing to measure up to this current version of the Devil. Sure, Gideon gouged the other eye and (might have) left the tongue behind, but the message is clear: this is a version of Hannibal Lecter. It’s the one we expect. Miriam Lass is trapped in the same meta-mythological maze. In the flashback that ends the same episode she is encouraged by Jack Crawford to follow a lead on the Ripper case that brings her to Hannibal’s office. A connection is found between Lecter and the sixth Ripper victim (of nine): he treated the man’s arrow wound when he was a doctor of bodies. In the same way that the literary Will Graham concluded that Hannibal was the cannibal, Lass found an illustration of Wound Man just before a masked Dr Lecter brutally attacked her. Where Will succeeded she failed, ending up Hannibal’s prisoner for three years. Jump ahead to season two and these symbols transform into warning signs. Both characters emerge, and each tears a vital organ out of the expected story arc. Miriam Lass is found by Jack Crawford, having been psychically driven to believing that Frederick Chilton mutilated her. As a result she kills the innocent shrink in a fit of post traumatic stress, shooting him in the face while he is being interrogated. Chilton is famously the gatekeeper to Hannibal Lecter, but the hungry killer hasn’t yet occupied a cell at the Baltimore State Hospital For the Criminally Insane. In the canon of the novels, Frederick lives to the end of Silence of the Lambs, but here he has perished before the main plot of Red Dragon has been reached. What he did was guard the cell of the old idea of Hannibal – in terms of what the character once encapsulated in pop culture – as embodied by Abel Gideon. This disregard for a fixed canonical sequence of events is punctuated with an exclamation point. After a brutal, spine-breaking beating at the hands of vengeful orderlies, Abel Gideon is abducted from his hospital bed and brought to Hannibal Lecter’s dinner table. Hannibal serves his fellow doctor the most delicious looking human leg ever shown on television: his own. They both consume themselves, one literally, the other in metaphor. Abel, the image of the old idea of Hannibal Lecter, eats himself to death as he comes to know the true Chesapeake Ripper. 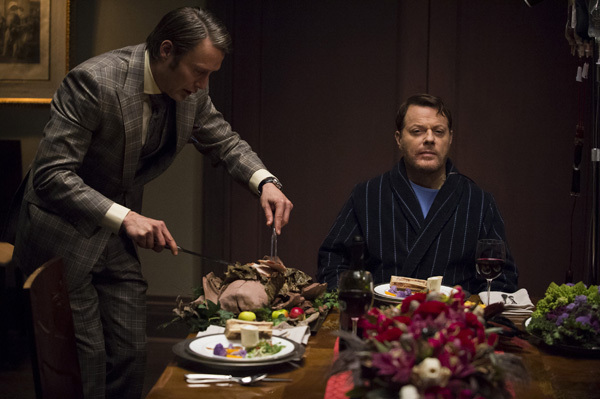 Off screen, Hannibal serves self-steaks to the man for days, eventually leaving the corpse in Chilton’s guest room. The symbol shines bright: forget the Hannibal you thought you knew. The images you find familiar will only disorient you. That is not the way to find the intelligent psychopath you’re looking for. On Friday night at 10 PM, Jack Crawford is scheduled for his final dinner date with Hannibal Lecter and we have already seen that it doesn’t go very well. After taking a close look at these more important symbols, Jack’s fate seems even less certain. The canon couldn’t protect Beverly Katz or Doctor Chilton and it can’t protect him. There were only two people at that table and Hannibal has already eaten himself.